Paris 1er - Place du Marché Saint-Honoré / Quartier Vendôme. Located on the 4th floor in a building of 1830 with elevator, 106 sq.m. quiet apartment comprising an entrance, a vast double living room - dining room with fireplace and unobstructed views on trees of Place du Marché Saint-Honoré, an independent eat-in kitchen, a parental bedroom with a window opening to a nice paved courtyard, a second large bedroom with two windows face to a courtyard (possibility to create a third bedroom with bathroom), a bathroom and WC. A 20 sq.m. large vaulted cellar is included. 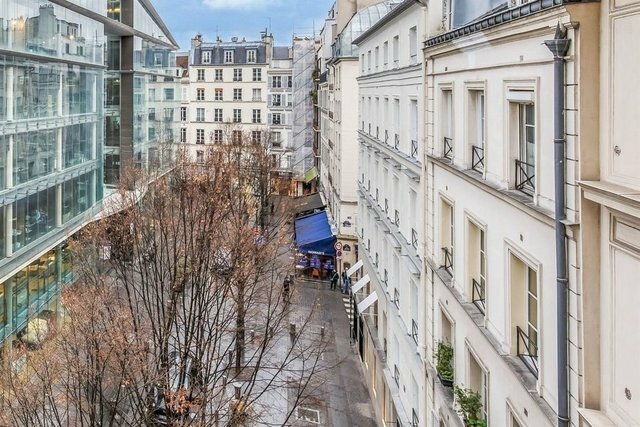 Bright, unobstructed views on Place Saint-Honoré. Ideally located ovn the heart of historical Paris, close to public transport, Jardins des Tuileries, Opéra Garnier and Place Vendôme. Paris Ouest Sotheby’s International Realty.